G-Boogie stops by again to chat with Dini Mussolini about all things, music, life in general and maybe some holistic ideas?? I don't know but set your reminders because it's happening! 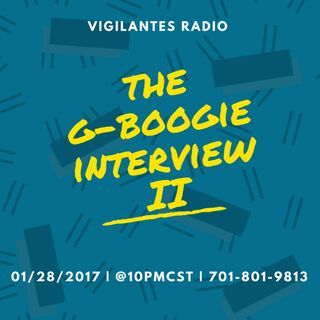 Tonight 01/28/2017 | @10pm Central Standard Time | 701-801-9813 or hop in the mix via the browser by visiting www.onlyonemediagroup.com/vigilantesradio.html and slapping that "Go Live" button. See ya there! Esplicito The G-Boogie Interview II.